Zazi Vintage is a luxurious fashion label that embraces and promotes traditional ethnic craftsmanship - a collaboration project including artisans from all over the word, where the emphasis is placed on sustainability and women's economic and social independence. "Fashion for me means story telling and the stories of the clothes I wear have to resonate to my beliefs. Because of this, I now no longer shop in chain stores, big companies or online. 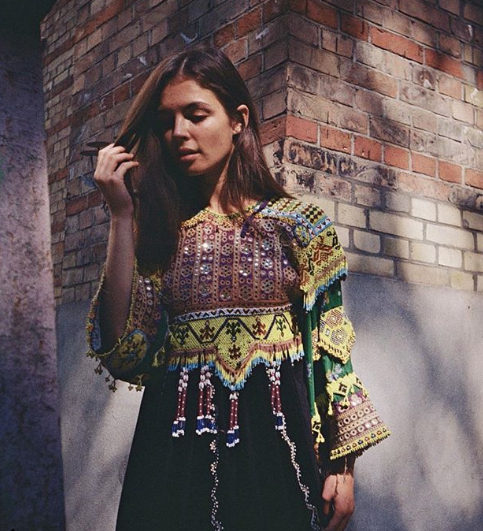 From countries like Guatemala to India, Lithuania to Ethiopia, I have gathered my wardrobe and found the most intriguing and inspiring pieces that all carry a unique story and connect me to another time, place and or person. I want people to know exactly where their clothes are coming from, by who they are being found by and exactly who they are supporting with their purchases. Portraying both these sides, I believe I can create a bridge, passing over what I have learned and continue to learn but also receiving lessons from the women of all corners of this wonderfully weird and beautiful planet earth that we are apart of". The label works with artisans in Uzbekistan, Mongolia, Turkmenistan, Tajikistan, India and Afghanistan. Current collections are produced with small families and women-empowering NGOs, such as the Institute for Philanthropy and Humanitarian Development in India. 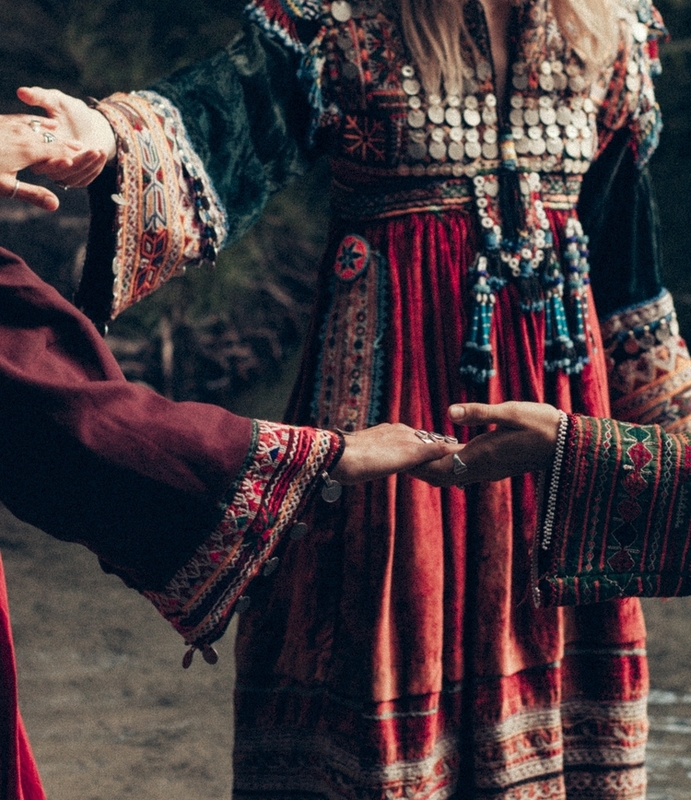 When a woman of the Afghanistan's Kuchi tribe got married, she wore one of these dresses combined with a Chador (head scarf) and tun ban (pants). Just one of these dresses takes about 4 to 6 months of handwork. The dense embroidery of the dresses arranging from heavy woven beadwork to special stitched coins that they found on their journey to the border of Pakistan combined with the rich materials of Silk, velvet and lighter woven work, make the dress a very special one. Baluch women put on loose dresses and pants with sophisticated and colourful needlework, including a large pocket at the front of the dress to hold their accessories. The upper part of the dress and sleeves are also decorated with needlework, a form of artistry that is specific to the clothing of the Baloch women. Often the dress also contains round or square pieces of glass to further enhance the presentation. 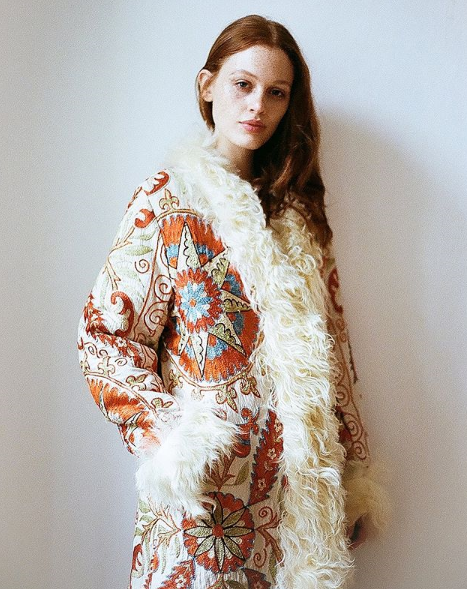 The collection is comprised of the most detailed handmade Suzani embroidery from Tajikistan, matched up with vintage Mongolian sleep rugs that were inspired by the Afghan Coats. 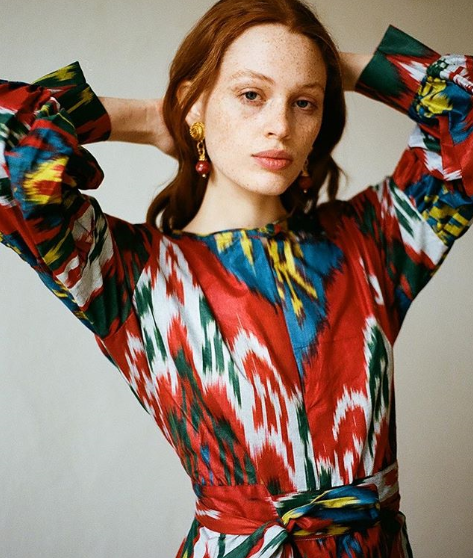 All of Zazi's Ikat woven dresses are handmade and are one of a kind. 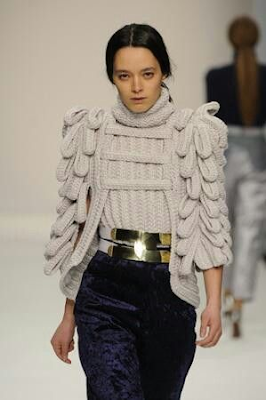 For this collection they worked with vintage IKAT from the border of Uzbekistan and Afghanistan. 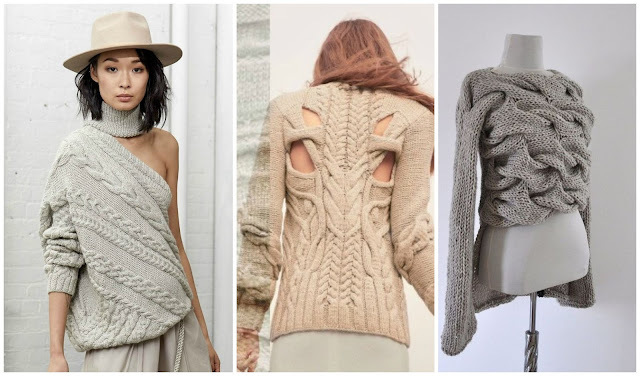 When it comes to knitwear, the fashion world has set the trend which was readily accepted by the knit and crochet community. 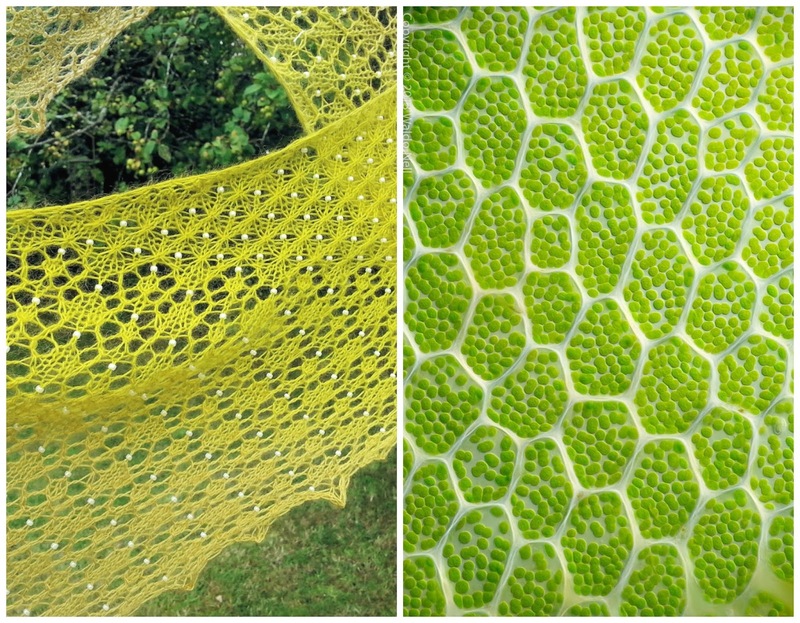 Structural biomimicry knitting and crochet. 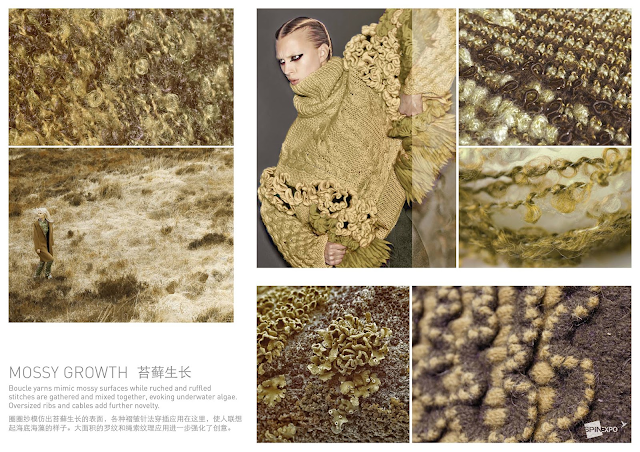 Garments made using different fibers to create intricate structures and textures inspired by natural forms. 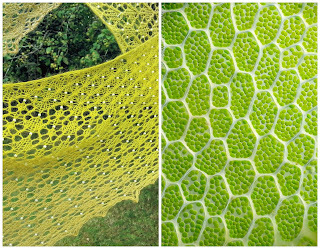 Nature has always provided inspiration for pattern and form in design and biomimicry is on the rise. 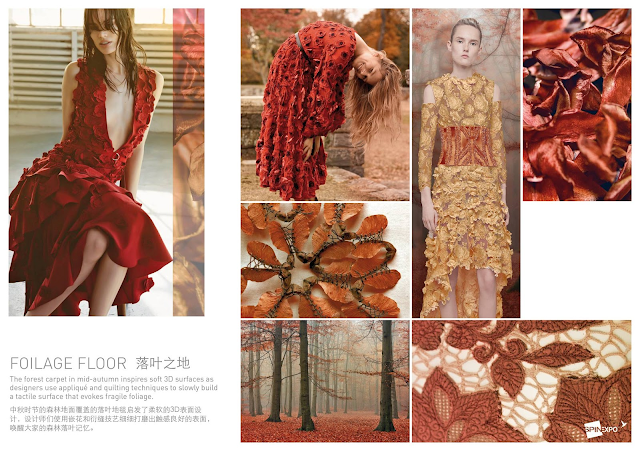 The original patterns of the flora are transferred into textiles using a mix of yarn, stitches and patterns. The symmetry of fine creases found in feather structures inspire new cable placements. 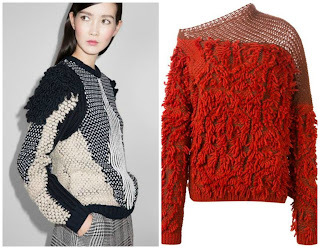 Lichen and moss open wide doors to the emergence of tapestry resembling knitwear, followed closely by the endless offerings of the reefs - algae and corals thus widening and bringing more excitement to the knitwear designing trends. Zani is a compatriot of mine who stole my heart with her deeply touching paintings showing her unique perception of human feelings, emotions and relationships portrayed with an explosion of colors that grab the beholder and leave a powerful imprint on him. 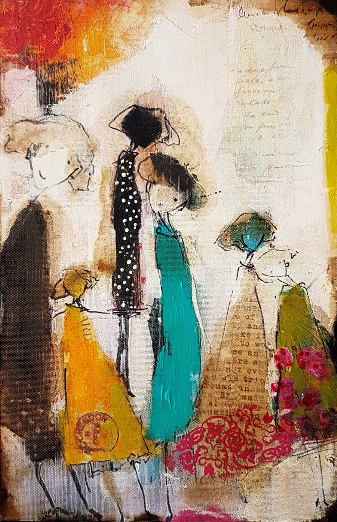 Her paintings tell incredible stories we can all relate to effortlessly. Zani graduated from the Faculty of Fine Art Skopje, Macedonia in 1989. She participated in numerous exhibitions in her native Macedonia, involving herself in various art related projects. Her work has reached over 15 countries worldwide and is in many private and public collections. 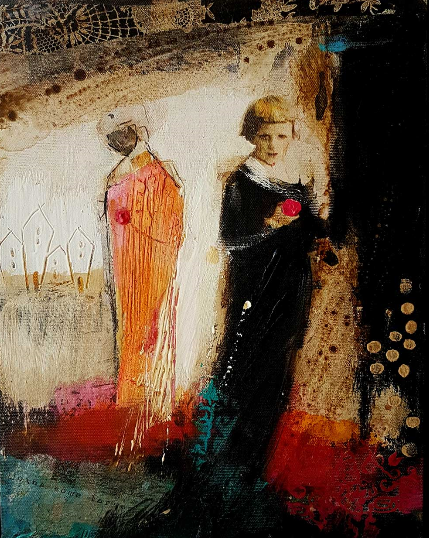 In 1999 Zani was invited to exhibit at the prestigious Blains Fine Art Gallery in Mayfair, London and soon after that she relocated to England, where she is now operating as a full time freelance artist. 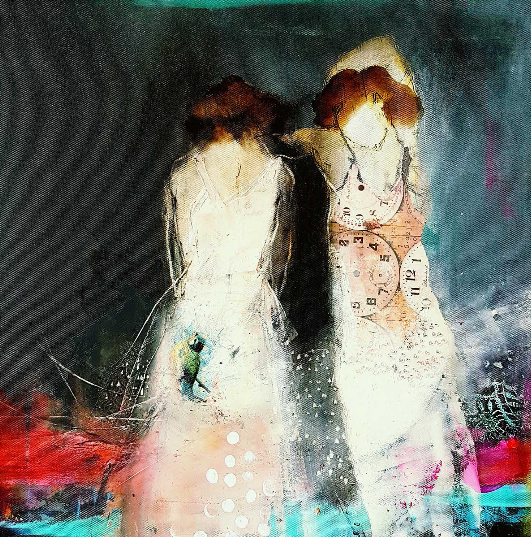 Zani is always experimenting and her paintings are a unique blend achieved by combining acrylic and mixed media and a range of unusual materials. 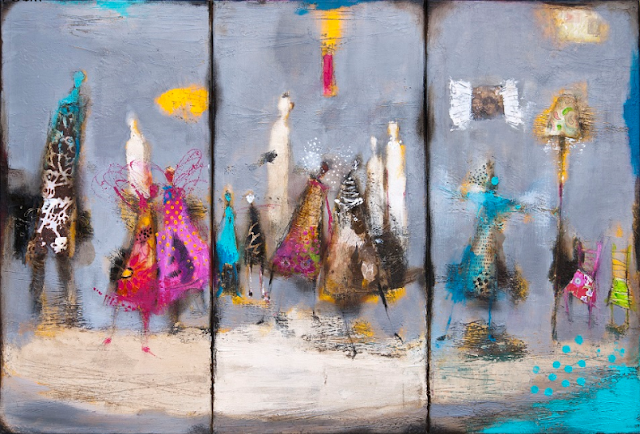 These materials have become a distinguishing feature of Zani's work and in many cases the materials dictate the form, as well as give the paintings their distinctive quality. 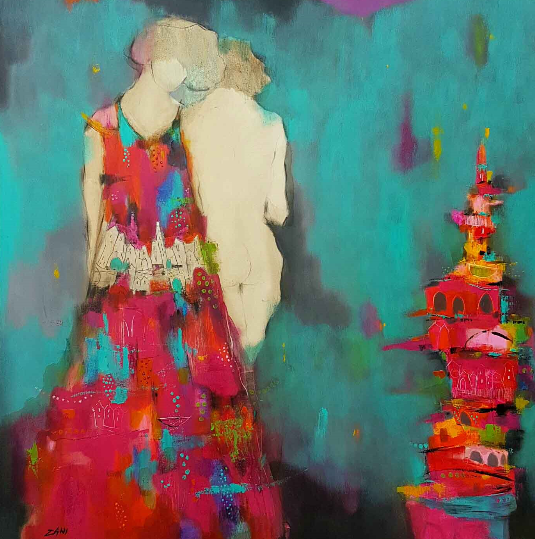 Zani's paintings have a powerful strength and refreshing spontaneity with rich variations of colour and tone. 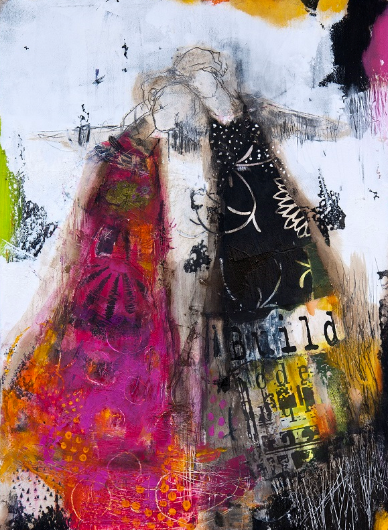 Most of her inspiration is drawn from ordinary people and everyday experiences and events. The work is often based on the relationship between public and private space, memories of the past and visions of the future. 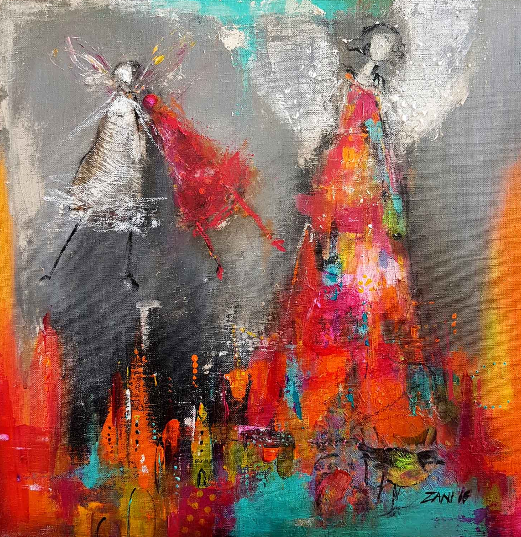 Zani is fast becoming a sought after talent in the world of contemporary art and exhibits her work during the year in a number of galleries in London and throughout the UK. However, a permanent exhibition of her work is on display, and can be viewed, in the Macedonian Embassy in London. Truly amazing, isn't it? If you were hooked on these, you can find more stunning paintings on her website and you can also follow her on instagram.